Sometimes, when a famous, brilliant actor dies with a needle in his arm, I read the comments from America and I can’t take it. There’s so much ignorance, so much blind condescension based on NOTHING. NOTHING. Opinion. Observation from afar. Some article you read somewhere. An addict you “know.” A drunk you worked with. It’s as if people think we start with a needle in our arm. Yeah. Newsflash. WE DON’T. Alcoholism and addiction are progressive diseases. THEY GET WORSE OVER TIME. We don’t start with a damn needle in our arm. We start drinking beer with friends in high school. We start like you did. What I loved about this, and think you will too, is the direct, simple, and passionate puncturing of all the myths we deplore about addiction. By the time I realized I was in trouble, I couldn’t stop. By the time I realized I couldn’t stop, I COULDN’T STOP. How do you change a mind with an insane mind? Tell me, how do you? How do you alter the thoughts of a brain when it’s the brain making the thoughts? Do you see the problem, folks? There’s where the element of choice gets really, really sticky. MY BRAIN IS MAKING THE CHOICES AND MY BRAIN IS THE PROBLEM. You’re telling me to “choose” different behavior when my brain is the thing that’s hardwired to choose more alcohol. She doesn’t leave us there, with this sense of hopelessness, because she eventually was able to recover from this sickness, and she tells us how she did it. I highly recommend you reading the rest of this deeply candid and insightful post on addiction. And if you are a mother, or thinking about becoming a mother, or simply want to know what it’s like to be a mother, you might want to take a look at her blog on Renegade Mothering. This entry was posted in Uncategorized and tagged addiction, alcoholism, drug addiction, Renegade Mothering, substance abuse by A Walk on the Wild Side Blog. Bookmark the permalink. gosh this is a post that hits home! Our brains are already wired to make these bad choices, because of years of abuse. And yes we all started drinking just the same way that everyone else did. Our brains lie to us in the end because we damaged our brains, and got hooked. Its guaranteed, you will reach a point of no return. I often wonder, will rehab be forever? I’m glad you liked it. It hit home for me too. I hope you read the rest of her post because there is hope. It may be a condition that will always have to be watched and managed, but living a normal healthy life is also possible. That’s a well done article. Lot’s of truths in there, presented simply and passionately. I can relate to addiction in terms of cigarettes. People are forever so self righteously claiming it’s all in our mind and we should just quit. Of course it’s all in our mind! That’s the whole problem! I know what you’re saying. While my son’s addiction is heroin, mine is sugar and fat (cookies!). You’d think abstaining from that would be easy, but it’s not. I get cravings hard to control and feel uncomfortably dissatisfied and restless if I go for long periods without sugar or fat in my diet. So I can imagine how even more horribly difficult it would be to try to abstain from something as addictive as heroin, or cigarettes. I loved this post, thank you for sharing. I think people judge really quickly without actually understanding. I refused to call myself an addict “WTH I am just a smoker, how dare you calling me an addict. But I am and if you ever watch people “trying” to quit smoking you will see the addict coming out. They scream and cry, they curse and get mad, they lie and relapse. 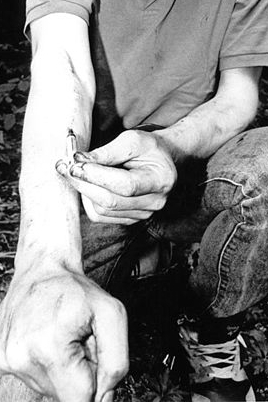 We don’t die with needles in our arm, we don’t run around with a bottle in our hands and die in a ditch. No, we die of cancer or cancer related diseases, quietly in a hospital room, mostly way too young. The more I read about addiction the more I try to involve it in my blog. I would never judge a drug addict, how could I. I want to thank you for your heartfelt blog, I always look forward to “read from you”. I hope your Son will kick the habit to the curb, I really hope so. Sorry for the novel! I’m glad you responded. Thank you. As I mentioned in my last comment response, while I can’t relate to drugs, I can relate to sugar and fat addiction. I know well how uncomfortable and restless and craving I get when I try to cut them from my diet. Coffee too is a problem. Maybe we are all addicted to something. Love this! It says everything I’ve wanted to scream to the ignorant world for over a decade! Me too! Thank you for reading and commenting. What a fighter – beautiful. Bittersweet because my husband didn’t make it – and voices like this help me understand a little more. I am so sorry for your loss. It breaks my heart.